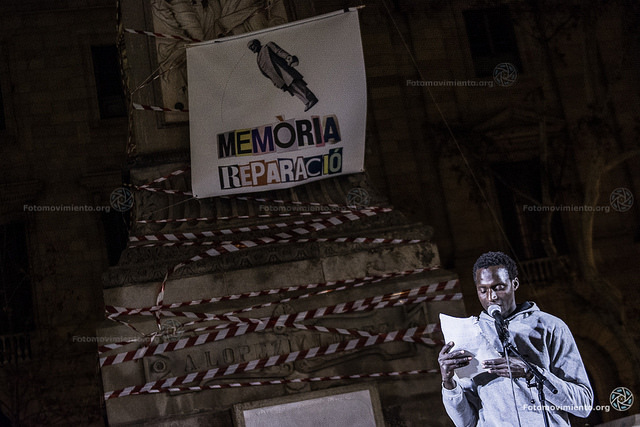 Lamine Sarr, a member of the Sindicato Popular de Vendedores Ambulantes (Union of Street Vendors) in Barcelona, speaking in favour of the #PlaçaIdrissa campaign in front of the statue of Antonio López on 13 January 2018. Photo by Fotomovimiento (CC BY-NC-ND 2.0). Until recently, the lifeless body of a young Guinean man named Idrissa Diallo lay in an unmarked grave in a cemetery in Barcelona — the police file about his death was closed and locked. However, his memory is being kept alive by his loved ones and also by many people and groups in Barcelona who never knew him with a proposal to name a city square in his honour. Idrissa Diallo was one of the migrants who managed to arrive on the continent alive. At 21, he overcame the enormous obstacle of crossing borders as he headed north — despite the ever increasing numbers of traps, walls, concertina wires and armed guards. After a long journey from Guinea, Idrissa arrived on European soil after crossing the fence around the North African city of Melilla, a Spanish overseas territory. However, Idrissa's journey tragically ended with his death on 6 January 2012 in a migration detention centre (CIE) in Barcelona. 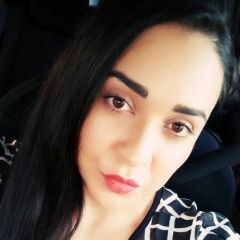 He was a prisoner there after having been detained for his “irregular administrative situation”, like so many other unfortunate migrants in Europe, and was waiting to be forcibly repatriated. After his death in police custody, the Spanish justice system archived the case without holding any of the authorities responsible. The police file was locked and has been inaccessible ever since, so the cause of his death remains unknown, although local human rights groups suspect possible medical negligence. On top of this mountain of institutional negligence, Idrissa's family were never officially told about his death, which violates the established protocols for these cases. Until a year ago, the location of his body was unknown. They hadn't called until now. His body hasn't been sent and we haven't had any more news. They covered up his death as if nothing had happened. It hurts. It's as if no one had died. It's so painful for me that his body hasn't come home yet. Tell the police and the government how much they've hurt me. In December 2016, five years after Idrissa's death, an investigation lead by La Directa finally managed to locate the unmarked grave where his remains were buried. This just a few months before the Montjuic cemetery in Barcelona prepared to move them to a mass grave to make more space. We found out the location of Idrissa Diallo's body, a man who died in the CIE 5 years ago: an unmarked grave in Montjuic. As a result of this discovery, and continuing with the documentary in Idrissa's memory, the producer Metromunster is preparing to travel to Guinea again next month, this time along with Idrissa's body. 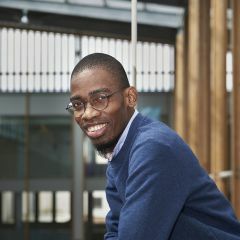 The death of Idrissa Diallo gave rise to the creation of the platform Tanquem els CIEs (Close the CIEs) in 2012. Since then, Tanquem els CIEs is one of the leading activism platforms in the fight against the procedures of the Spanish, and also European, migration control systems. 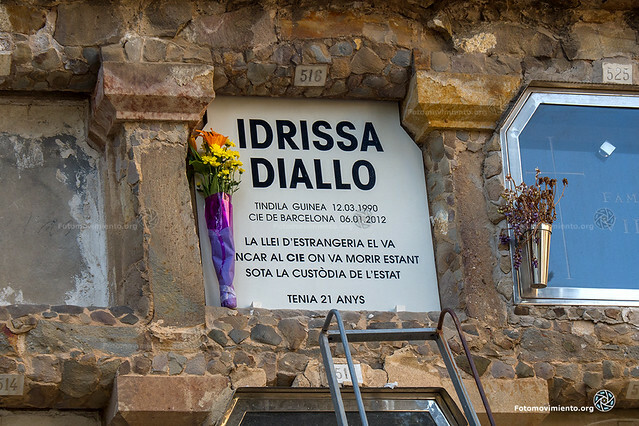 In June 2017, after Idrissa's remains were located, Tanquem els CIEs organised a meeting in the Montjuic cemetery, Barcelona to place a gravestone with Idrissa's name on the grave where he is buried. Tanquem els CIEs place a gravestone in the grave where the young Guinean has been buried since his death in the CIE in 2012. Six years after his death, Idrissa has become a symbol of migrants’ struggle for rights in Spain. Today, the city in which he died is mobilising to pay tribute to his life and the lives of so many others like him through a citizen campaign promoted by Tanquem els CIEs and Metromunster, aiming to name one of its squares after Idrissa Diallo. The pinnacle of this historical correction attempt is the choice of square. The square which currently holds the name of a known slave owner from the 19th century: Antonio López. 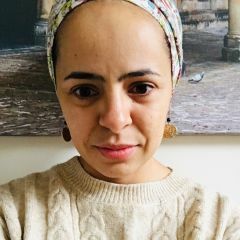 We are collecting signatures to carry out a corrective act in memory of Idrissa and every other migrant who suffers and has suffered from racism and institutional violence. Come to one of the points and sign. Goodbye Antonio, hello Plaza Idrissa! His is just one forgotten case among those of so many anonymous Africans who are and have been victims of colonial policies practised in our country for centuries and which have led to the current migration control system. Idrissa, however, did not die in the Mediterranean, nor crossing the valleys of Melilla like so many before him. He died in Barcelona. As residents of this city, we owe his family an explanation and a corrective act. A tribute which extends to everyone who has been a victim of the dealings that have made the West rich for more than 500 years, thanks to the pillaging of the ex-colonies. If Antonio López is a symbol of these dealings, Idrissa Diallo could become a symbol of the numerous anonymous victims who have been suffering this institutional racism for centuries. Signatures are currently still being collected at various points in the city of Barcelona and all sorts of acts are being carried out in memory of Idrissa and in favour of the initiative. You can follow the campaign activities on Twitter by using the hashtags #AdéuAntonio and #PlaçaIdrissa, or on the Tanquem els CIEs website. A plaque dedicated to Idrissa Diallo in the place where his remains are buried, placed there during a tribute on 14 June 2017 in Montjuic cemetry, Barcelona. Photo by Fotomovimiento (CC BY-NC-ND 2.0).